There’s an article up on the ABC News website today National Disability Insurance Scheme: Where will the funds come from? The good news is we answered it years ago in 2011 as was published in the Sydney Morning Herald The Right Way to Pay for the NDIS. Read more about Paying for the NDIS is easy!! ANZAC Day is a national day of pride. A day of pride in the enduring spirit of mateship and ingenuity. I think Minnie Mace who I saw on SBS’s Living Black quite some time ago talking about various faiths of today’s Aboriginals said it best. What a difference 12 months and more makes. The budget surplus or deficit, level of debt, interest rates and value of the Australian dollar are the tools used to achieve those objectives and are not the target in themselves. 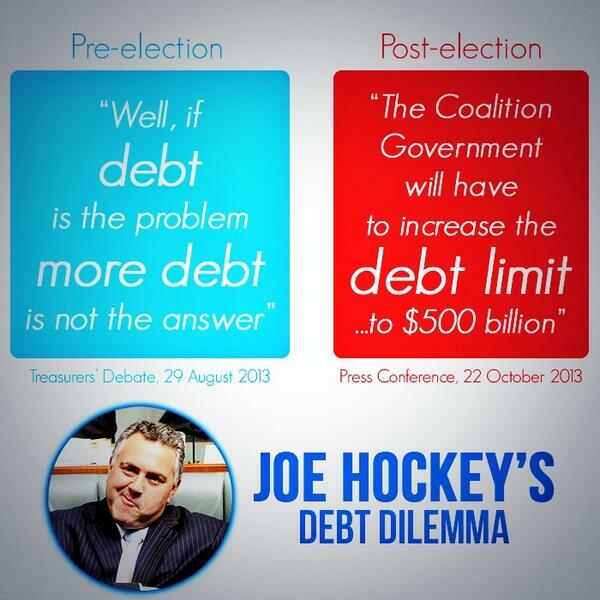 On Friday, The Australian Financial Review reported that Hockey was “mulling” the idea of separately classifying debt the federal government raises to invest in infrastructure projects from the debt required to finance the budget deficit. Read more about Bad Debt? Good Debt? Complicated Mess!